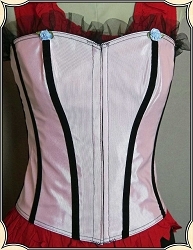 Underbust or waist cinch corsets are a great way to achieve that slender waist look. Sully Cotton ruffle trimmed Victorian Pantaloons are long, full cut and comfortable and available in three great colors. 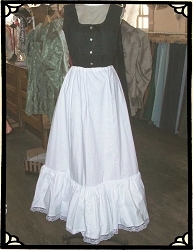 Our Old West Flimsies Petticoat is made of Cotton with a Drawstring waist and available in three great solid colors. 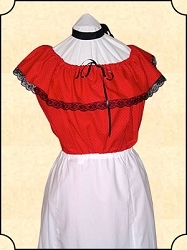 A one-size-fits-most all-cotton Victorian undergarment that has a drawstring waist and is trimmed in lace ~ see also our other coordinating Heirloom Brand undergarments. 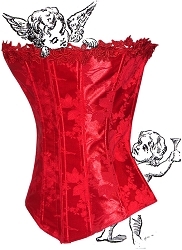 Don't let our low price fool you, this is a quality USA-made brocade Victorian corset with lace trim, featuring an authentic hook and eye closer in the front and corded lacing in back for shaping. 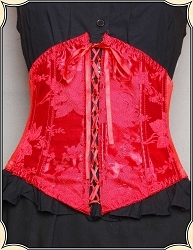 A great Cotton garment to wear under your corset is perfect for any Saloon Gal or proper Victorian Lady. Our Heritage brand Ladies Camisole is made with Cotton and is perfect under any Corset.